Windsor Branch meet at the Alma Road Social Club on the 1st wednesday of every month, contact the Hon. Secretary for further details..
West Ham Branch meet at the West Ham United Supporters Club on the 1st Monday of every month, contact the Hon. Secretary for further details..
Uxbridge Branch meet at the RNA Club on the 1st Sunday of every month at 1200. South Harrow Branch meet at the Royal British Legion Club on the 2nd Tuesday of every month at 2000. Kingston Upon Thames Branch meet at the Grafton Club on the 1st Thursday of every month at 2000. Kingsbury & Kenton Branch meet at the Wembley North Conservative Club on the 3rd Sunday of every month at 1030. Hanworth Branch meet at the RNA Club on the last Wednesday of every month at 1100. 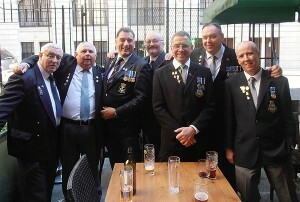 Greenwich Branch meet at the Ex Servicemen’s Club on the 4th Wednesday of every month (Except December). Greenford Branch meet at the Royal British Legion Club, no further details have been published on the RNA HQ website, please contact the Hon. Secretary for further details on meetings.